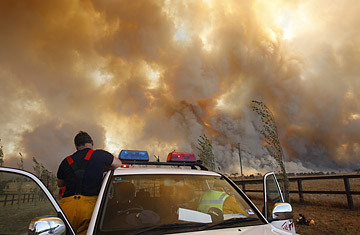 The raging infernos that have left more than 160 people dead in southern Australia burned with such speed that they resembled less a wildfire than a massive aerial bombing. Many victims caught in the blazes had no time to escape; their houses disintegrated around them, and they burned to death. As firefighters battle the flames and police begin to investigate possible cases of arson around some of the fires, there will surely be debates over the wisdom of Australia's standard policy of advising residents to either flee a fire early or stay in their homes and wait it out. John Brumby, the premier of the fire-hit Australian state of Victoria, told a local radio station on Monday that "people will want to review that ... There is no question that there were people who did everything right, put in place their fire plan, and it [didn't] matter  their house was just incinerated." Destructive wildfires are already common in Australia, and it's not hard to see why climate change would increase their frequency. The driest inhabited continent on the planet, Australia has warmed 0.9°C since 1950, and climate models predict the country could warm further by 2070, up to 5°C over 1990 temperatures, if global greenhouse-gas emissions go unchecked. Beyond a simple rise in average temperatures, climate change will also lead to an increase in Australia's extreme heat waves and droughts. Southwestern Australia is already in the grip of a prolonged drought that has decimated agriculture and led to widespread water rationing; the region is expected to see longer and more extreme dry periods in the future as a result of steady warming. That's one more reason why the world must work together to reduce global carbon emissions to minimize the impact of climate change. The trouble is, though, CO2 cuts won't be enough. As a recent paper in the Proceedings of the National Academy of Science points out, even if we are successful in cutting carbon emissions rapidly  hardly an easy task  the momentum of climate change will continue for centuries. That means our ability to adapt to the impacts of warming, including more aggressive responses to wildfires like those in Australia, will become all the more critical, lest natural disasters turn into human catastrophes. But it also means that the world we've become accustomed to will change, perhaps irrevocably. The wildfires in southern Australia are already the worst in the nation's history  but they surely won't be the last. See pictures of Australia's hidden islands. See pictures of the world's most polluted places.